Outfield players are more likely to receive praise when a team performs exceptionally, yet goalkeepers are often ignored until they are put in a position where they spotlight is on them, such as penalties. Cameroon’s Fabrice Ondoa and Abdoulaye Diallo of Senegal were the stars of the show, performing goalkeeping abilities way above their respective ages of 21 and 24. Ondoa’s performance in the game will be the most memorable of the two, especially as the game progressed and Senegal became even more dangerous in front of the goal. The opening 45 minutes barely tested the goalkeeper, who mainly had to catch crosses and launch goal-kicks after a series of substandard finishing. Once the second half began however, Ondoa had to be alert for the barrage of shots heading his way. Mame Diouf and Keita Balde were the source of these shots, requiring the goalkeeper to show his positional and agile capabilities. Towards the end of the first half, he kept out Moussa Sow on several occasions to keep Cameroon in the game. The penalty shootout is where the young man shone the most, despite conceding four. He almost managed to keep out Kara Mbodji’s penalty after getting a hand to it, but the post proved to be an enemy rather than an adversary in that situation. 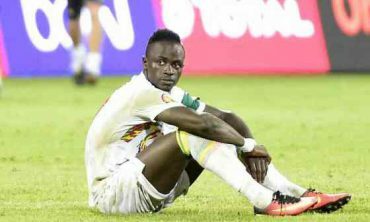 Up stepped Sadio Mane, who approached the penalty spot with the intention of putting Senegal 5-4 up. Ondoa maintain his focus and dived to his right, making the only (and game-winning) penalty save during the shootout. Diallo was seldom troubled in the early stages of the game as Senegal dominated the game. When Cameroon finally threatened the defence, Diallo was on hand to pull of a string of great saves. He pulled off a cracking save when he dived to his right to stop Moukandjo from slotting the ball home. Towards the end of the first half of extra time, he denied Zoua from scoring what would have been the winning goal, eventually leading to the heart-breaking penalty shootout for him and his Senegalese teammates. The goalkeepers rightfully deserve praise after their dazzling performance, but the strikers are also to blame for failing to test them in numerous situations. Senegal in particular will be distraught after squandering so many chances throughout the game. A few chances went begging in the first half, Kouyate being at the centre of most of the wasted opportunities. A header that went over the bar and a shot that sailed into the stands were the most notable. Keita Balde also had a host of opportunities too, but they either missed the mark of were saved by Ondoa. Mame Biram Diouf, who arguably didn’t have a good tournament, also failed to make the most of his chances. His replacement Moussa Sow was just as bad. Despite getting into better positions than Diouf, Sow’s finishing was lackluster as he hit the side netting and fired shots straight at Ondoa frequently, including 1-on-1 chances. At the end of the game, Senegal had made 20 shots with only 9 on target, summing up their poor finishing ability when it mattered most in this game. With some times there’s nothing revolutionary or mouth-watering to see, and Cameroon is one of them. They have only won one game within 90 minutes, with the win coming in their 2-1 defeat of Guinea-Bissau. They are aware of their limitations, sit deep and pace is ubiquitous in their team, which makes them a danger. Bar the effervescent Christian Bassogog and Ondoa, it’s hard to pick another outstanding Cameroonian individual in this tournament, meaning it’s very much a run instigated by the collective. They are not a team that offers much to write about, they are, on the whole, not particularly easy on the eye and it’s hard to imagine them ever going goal-crazy. Hugo Broos has, for the most part, just put out some relatively unknown players together and they have gelled together very quickly. There’s a beauty in that simplicity. We like to say that the teams which played well earlier in the tournament and then don’t go on to win peaked too early; that was certainly the insinuation as the Lions of Teranga exited the tournament. The excellence of their showing versus Zimbabwe was suddenly cast aside because of the weakness of The Warriors’ defence. It’s difficult to play well in all your games, past AFCON champions, for the most part, haven’t. There has always been a game, or games, they have stuttered, or had needed penalties to stumble through. When that happens you do need a little slice of luck, and you could say that is what deserted Senegal. Aliou Cisse’s side shouldn’t have let it get to penalties with Cameroon, that’s the biggest fault you can pick with them. More urgency was needed from the start and a switch of Mane to behind the striker wouldn’t have done their chances any harm against a stubborn Cameroon side. Bowing out unbeaten is a reaffirmation of Senegal’s potential, though history will not remember them kindly as success and failure is recorded in such a black-or-white manner.